All of the software included with Nero BackItUp & Burn is designed to be as consumer-friendly as possible. While this results in an interface that can ignore convention in favour of being bubbly, it's still remarkably easy to use due to a reliance on well-explained wizards. Beyond the basics, there are advanced options that enable you to set up scripts and choose the CPU priority of each task, minimising slowdown when recurring events happen in the background. 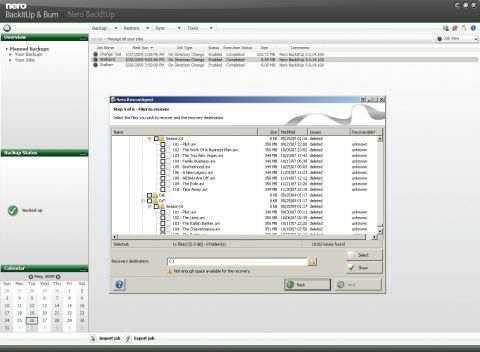 Where BackItUp stumbles is in its associated online service, Nero Online Backup. Three months of free access is included with 1GB of available space. But as soon as payment is necessary, the deal becomes considerably less sweet. For 5GB, it costs £10 for a further three months. More damningly, a 12-month subscription with 25GB of storage costs a hefty £80, compared to just £40 for a year and 100GB on Livedrive. If you're looking for an all-purpose solution, though, this will more than fit the bill.